Over the last 2 year I have spent many hours on a site called graphicriver a place for selling design templates of all sorts, it is a great place with many talented authors so I have decided to interview artists from the site and this is the first of many more to come. I hope this will help people understand how other designer work and what processes they go through. A friend got me started some number of years ago, not really sure how long but it’s been a while, close to a decade I think. Anyway, he showed me photoshop (photoshop 7) one day and I were hooked, I went home, downloaded the trial and started playing around. First it were manipulations and very basic design stuff but never got hooked on either of those paths. It weren’t until I stumbled across PSDTUTS many years ago that got me into web design (Thank you Collis). Since then I’ve never looked back and I haven’t reconsidered my decision one bit. Everything I know, all technique’s, all my knowledge about Photoshop are self-thaught. I started with learning about the trends and how the industry works and just went from there. Best advice I have, never be afraid of loosing, never be afraid of taking a risk and never complain more than it’s worth. Listen to feedback, no matter if it’s constructive or poor. Make the best of each situation and you’ll come out a winner. Polishing – fixing edges, layer styles, etc.. There are so many, but foremost I visit Dribbble, Creattica, DesignDelight and UIParade. I’ve never cared much for Forrst or LoveDesign but I guess some people do and I bet a lot of people gets inspiration from those sites as well. As I’m a GraphicRiver Reviewer I tend to browse the library there and it never stops to amaze me how many talented authors there are there, it’s so much fun to browse GraphicRiver and ThemeForest for inspiration. If you haven’t you should definitely try! Tough question but I think I have an answer for you. From my point of view the most important thing is to have the will of doing what you love. If one lacks the will, then there’s nothing one can do except starting over again or maybe even consider changing profession. If you have the will and know-how to make a change, do it, don’t wait, just do it. As I’ve been in the middle of a move very recently, we’ve still got boxes to unpack, I took the opportunity to get a completely new home office for myself. Everyone needs a place to do their work and mine’s great so far, but I’ve got a few things planned to enhance it a bit more soon enough. Amongst them are a new chair, a shelf, an iPad, an iMac 27″ or a new screen. 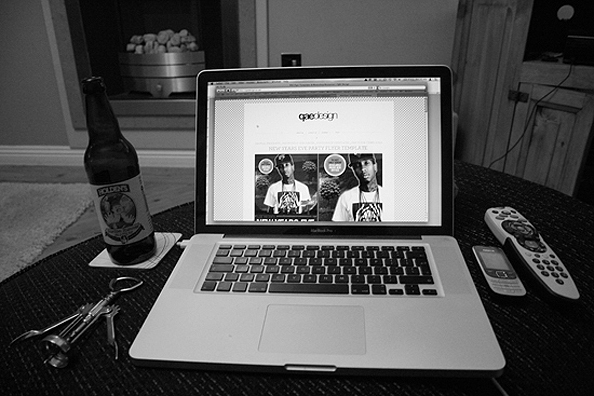 I love my MacBook Pro 13″ (2011 late model) but I’d love to have a bigger screen sometimes. Anyway, the thing that makes my new workspace so special for me are my two Star Wars bobbleheads. They always nod when I come up with a stupid idea and they even nod when I come up with a great idea-I just love it! 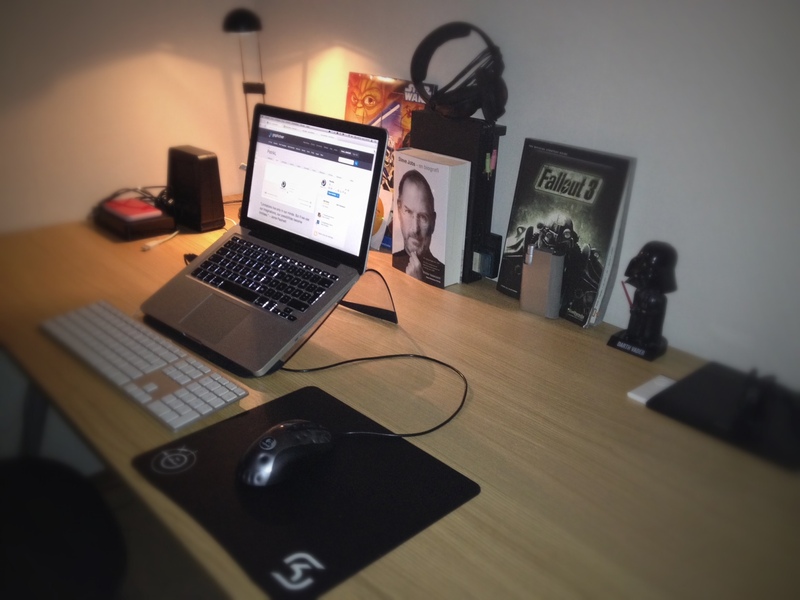 Below you can find a picture of my newly setup workspace. I hope you’ll like it! That’s hard to say, as the web changes from day to day it’s a very hard question. But my predictions are that we’ll see more and more web apps coming in 2012. As the web changes so will the way we use it. As for design trends I have no idea but I guess it might be minimal, minimal were a big part of 2011 and I don’t see any reason for it to stop. I play video games, taking a walk, watching TV or just talking about various stuff with my girlfriend. Most of all it’s talking to my gf, taking a walk and video games. That’s pretty much it really. I play a lot of Fallout 3 again but I also play a lot of Minecraft to keep the creative juices flowing. Well, one might think I’m most proud of everything I’ve done but that’s not the case at all. In fact, I actually dislike 90% of my work, including successful work. But the thing I’m most proud of is one of my latest freebies actually, my Music Player I did a couple of weeks ago, it’s pretty much one of the very few things I can still look at without hating it. I just love the way it turned out and I’m really proud of it. Check it out, and while you’re at it, check out and grab all my other freebies as well. My biggest goal for the moment is to get my new site up and running properly, hopefully I can have it done by March 15 but in worst case scenario it might take a wee bit longer. However, my main goal for 2012 is to really kick my new business off the ground and my new site will help me do that. Got lots of fun stuff planned and I hope that you’re all with me on this journey. First, let me thank you for this wonderful blog you’re managing, I like your way to share knowledge and love of arts, and thank you also for choosing me to be interviewed. My first design experience started years and years ago… When I first got a PC with the Win 3.11 on it well not that long, it was just in 1994, I started then to discover the digital world. Using it for playing the few games we had that time (that was a source of inspiration for me… Prince of Persia especially) I started to convert my hand drawings using PAINT to make a Soccer Game that I never finished! then I went on and started with Photoshop and all the Adobe suite over the years. I’m now well self-skilled in 3D, Graphics, Webdesign, Motion, and Photography. Every single project of mine starts with a pen and a white piece of paper, scratching is the first fun part of every project I make, then go armed with my Mac or PC (depending on the project), and dive into deep creativity ’till the baby get born! Creativity, and love of the job! 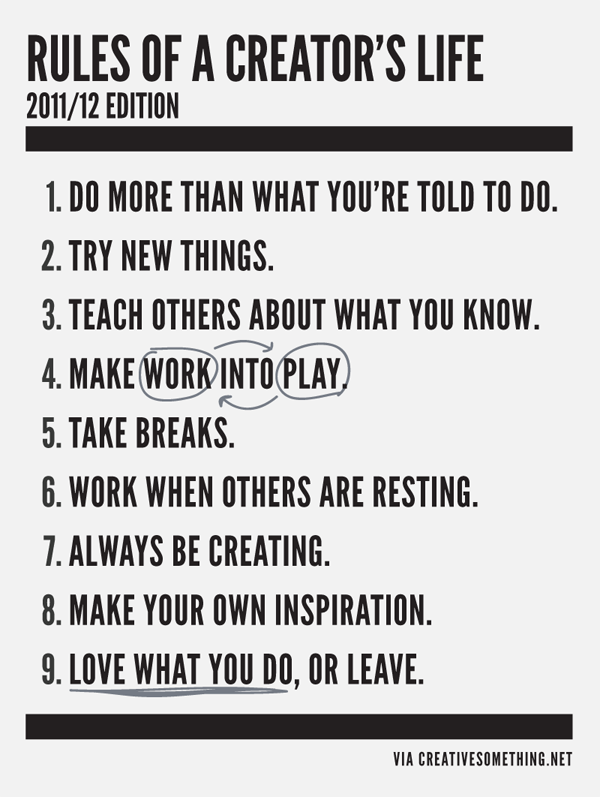 the two most important skills that every designer must have or develop, actually there is a list that Greyscalegorilla shared with us (Rules of a Creator’s Life), thanks for him, and it’s my turn to share it back, ‘cuz I think that’s a pretty important list, needs to be checked out, and I like the last quote pretty much. Trends for 2012!? well, no one can knows but we can expect from the web to get into it’s highest level, motion is talking the second place, and after the rest comes no matter the order will be but I think the Envato market places will be more full with great artists, it becomes more and more competitive, especially after the announcement of the ENVATO MARKETPLACES AWARD 2013! The News design Pack is my favorite project, it’s a full modern high quality broadcast news channel, but I recommend you to visit my whole portfolio, there will be some interesting things you may need, and maybe get inspired from! I try new things, put the thing in standby and get inspired from the real world, when it comes to its highest lever, I shut-off everything, get out of the digital world go to the most important person in the world “my wife” and get comfort from her! believe me, it works… spending time with your family is the most important thing you should have! they’re there for you, as long as you have to be there for them! Vixen Free Flyer Template : Flyerheroes.com/vixen from Adam McIntyre on Vimeo. I tend to stick to the usual of DeviantArt, Behance & Creattica. Sometimes I wander around Ffffound, but that’s exactly it – I wander around, get lost and an hour later I can’t even remember what I was originally looking for. Specifically as an inspiration for my craft, i.e making flyer templates, I have a big folder on my computer and a folder in Chrome just FULL of bookmarks to interesting works. I also make regular flyer design inspiration posts on Flyer Heroes. My work area is wherever I choose to sit in the house. 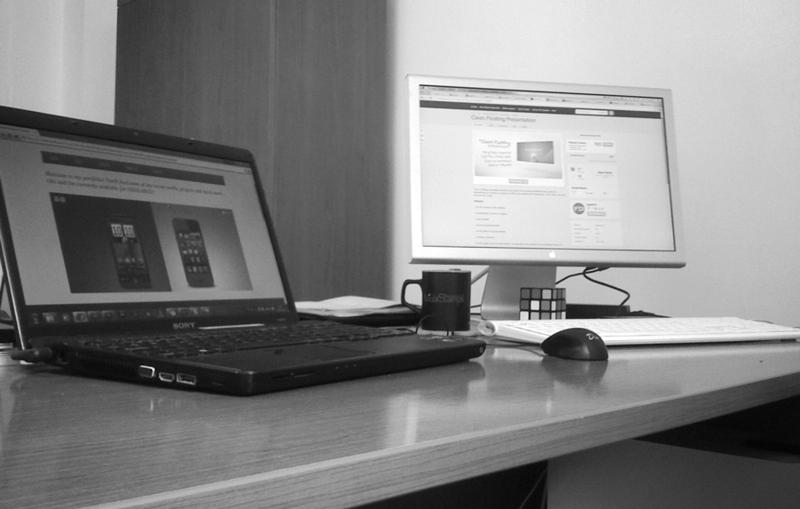 Either in my office, one of my lounges, dining room, bedroom… Ahhh I love having the freedom of a laptop. I really don’t know. In regards to the Micro-ISV market on places like Graphicriver, things will definitely become more competitive, the quality of your competition’s items will increase and it won’t be as easy as it once was to instantly start getting sales on your items. I’ll be working on something, eating, watching films or working on something. Oh, did I say working on something? A3 Drinks Advertisement Poster Template. Clean, crisp, highly usable and selling really well. I recently designed a follow up to it, Drinks Advertisement Poster Template Vol. 2, which is also working it’s way through the sales. I’m also very proud of Flyer Heroes and our growing list of Free Flyer Templates. A blog I started a few months ago for my rejected flyer templates + it has surprisingly picked up it’s traffic and is beginning to gather a bit of traction here and there! Work on something else, take my mind off the project for an hour or day, browse the net looking for inspiration or refer to my growing collection f design related books. As we all know, creative block is just plain evil. Personally, for 2012, my main goal is the sheer dedication to increasing my Graphicriver market share. I want to be in the top 50 Graphicriver Authors in the next 4 or 5 months. (currently #94) I also plan to create a crash course for new authors revealing some great techniques for jump starting your Graphicriver career. If you’d like to connect with me online, feel free to check out my personal website, QAE Design or find me designing free flyer templates over on FlyerHeroes! Thanks, Adam.